[Updated 6:03 p.m.] Police in Lufkin, Texas, have made an arrest in the case of a barista abducted from an Anchorage, Alaska, coffee stand in early February, Anchorage police said Friday. 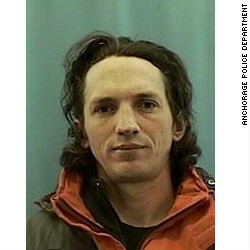 Israel Keyes, a construction worker from Anchorage, was arrested after a traffic stop in the Texas city on Tuesday, Anita Shell, Anchorage Police Department public information director, told CNN. “He was arrested for fraud and related activity in connection with access devices, which is a felony,” said Shell, adding that she couldn’t comment further because the arrest warrant in the case has been sealed. The arrest was a multi-force effort by the Anchorage police, the Federal Bureau of Investigation, local law enforcement agencies in Lufkin, Texas, as well as the Texas Rangers. Samantha Koenig, an 18-year-old barista, was snatched from her parking lot coffee stand by a hooded man on the evening of February 1. Authorities still need the public’s help in finding the missing woman as well as information related to Keyes since January 1, the Anchorage police said in a statement released Friday. “He’s the only person charged in this case,” Anchorage Police Detective Slawomir Markiewicz told reporters on Thursday. Police would not elaborate on details of what the detective called a “sensitive” case. The detective said police have no evidence that Keyes and Koenig knew each other before the abduction. Markiewicz said police know when Keyes went to Texas but he would not give any details. Police arrested Keyes after finding evidence in his vehicle linking him to an out-of-state kidnapping, Texas law enforcement officials said, according to a report on KTVA.com. Keyes is being held in a federal detention facility in Beaumont, Texas, Shell said. Anchorage detectives have been in Texas for several days investigating the case, she said. In Anchorage, police have searched the home where Keyes lived and are asking for anyone who has done business with Keyes’ one-man construction company to contact them, the Anchorage Daily News reports. A website for that company says Keyes moved to Alaska in 2007 after previous jobs in Washington state and three years in the Army. Koenig’s abduction sparked fear in one of the hallmarks of the Anchorage community, its numerous coffee stands. Baristas reported taking increased safety precautions after Koenig was taken.